Pigeon wants a puppy. He imagines all the wonderful things that they would do together and he makes promises to care for his puppy as best he can. But Pigeon learns that what you want isn’t always what you expect it to be, and that sometimes, you might have wished you wanted something completely different. The one thing that I adore about children’s books is that there is more going on than what appears. That’s what’s going on in this book. It starts off very casual. When Pigeon starts telling you about what he wants, right from the get go, you are very amused. Part of the amusement is due to the anthropomorphism of the pigeon. Real pigeons don’t talk or desire for pet dogs the way humans do. Another part of the amusement comes from the illustrations. They are simple and very minimalistic, but adorable, and paired with the story can make you laugh. The cadence of the wording and the illustrations flow together to tell this funny story with this endearing and hilarious character. Fun for kids ages 0-100. 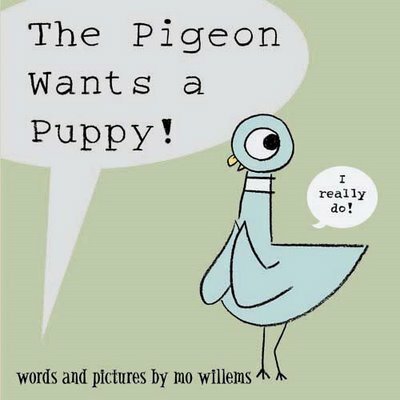 Mo Willems has written numerous books, and The Pigeon Wants a Puppy is not his first adventure with Pigeon. With other titles such as Don’t Let the Pigeon Stay up Late, The Pigeon Needs a Bath, Don’t Let the Pigeon Drive the Bus, and so much more, you can be sure to have fun and hilarious adventures with Pigeon! There is a teaching guide that was published that provides activities and discussions for children who have read Mo Willems’ books. One in particular for The Pigeon Wants a Puppy engages conversation with children about how you are supposed to take care of your pets. Use Pinterest to find more crafts and activities to go with your Mo Willems lessons or story times!